I’ve got an internal website that runs in IIS 6, for which I have enabled SSL. Due to the nature of this website, and the login credentials used, I want to make sure any access is always encrypted, but still allow my users to access it at http:// for ease of use. Fortunately I found a pretty simple way of doing this with IIS 6 (I don’t know whether it’s still supported in IIS 7, but I imagine it would). 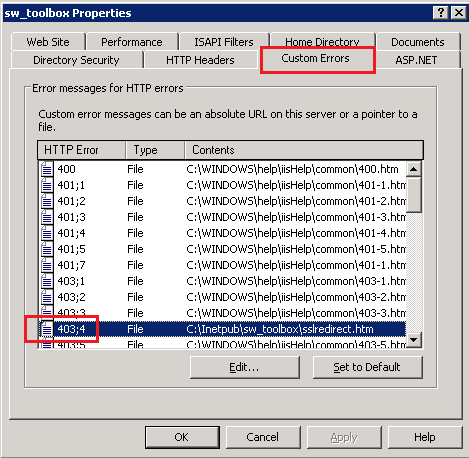 Then, go into the properties of your IIS site, and on the Custom Errors tab, change error 403:4 to point to your sslredirect.htm file. Now, if someone opens up http://www.website.com, it will automatically redirect them to https://www.website.com.